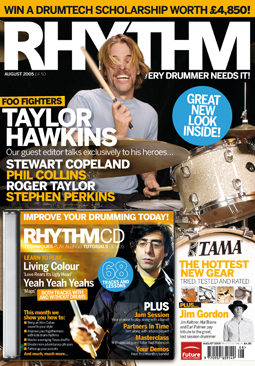 Taylor Hawkins reveals what went on during the writing and recording of the new Foo Fighters album, and gives us a track-by-track breakdown of his favourite songs. Recording our last record, One By One was really fun, because we just went in and did it. You can hear that my drums were done in six days, but it has that energy to it which is great. With In Your Honor, though, we really did our homework and, without over-thinking things, we really thought about everything. We spent last summer in pre-production - honing the music down - working on the arrangements and the drum parts so that they complemented the song, and making sure that the riffs and the bass drum patterns fitted together well. We have never been as prepared going into the studio as we were this time round and have really challenged ourselves, both musically and as songwriters. "The big difference for me on this record was that I had drum tech, Gersh, working with me in the studio. Gersh is a drummer too and has been doing sessions in Los Angeles for 10 years. He understands how to tune drums and make them sound good. It's a real art and meant that all I had to worry about was playing. I'm the first to admit that I am more comfortable on stage than I am in the studio, but I felt like I had a great support system around me this time. I'm sure I will become more comfortable with each record that we do, but when I'm in the tracking room and all eyes are on me, I'm just desperate to get it right! Drums are tough because they are the first ching to be recorded and they are the foundation of the song. We used a click on most of the tracks on The new record. "Gear-wise, we have used a real mixture of stuff. Gersh got a conglomeration of mine and Dave's Zildjian and Tama stuff; and some vintage drums, and we would mix and match for different songs. Sound-wise, we have experimented more on this record than ever before, and we have tried to make every song different. "Doing an acoustic record has been really fun, and we recorded it very quickly. We've captured chat looseness and in a way it was almost like doing demos. I did most of my drum parts in about 20 minutes:and my favourite drum performance on the acoustic album is 'Razor'. I'll leave you to draw your own conclusions as to why..."
"This is the coolest drum sound on The record, and the drum rolls are very Who-esque. As well as being a great introduction to the rock record, it is almost like a mission statement." "This is the first song that we recorded drums on and I love the big, wide, open sound, and the bouncy, upbeat tempo." "The dynamic of the drums, and the song itself; is what I really like about this track. It starts in one place, it keeps building, and then it comes back down at the end. What's even better is that I also get to do a bit of a drum solo at the end."" "We actually recorded this one rwice. First time round it had more of a lo-fi, indie rock sound, but we tried it again with a much harder rock feel and the results are great - it's a really strong song." "Dave and I recorded this live in the studio without a click, because we wanted the time to fluctuate. It starts off in one tempo and moves up - perfect for someone like me who tends to speed up!" "This is a great track to play live. It's very upbeat and I nailed the drums in two takes." "Rhythmically speaking this is one of my favoutite songs on the record, and is the proggiest out of all the songs. It has a very aggressive and interesting feel-moving from 6/8 into three over four." "Another one of my favourite tracks and another that's in 6/8. There is just something about it and I love the lyric 'The Deepest Blues Are Black', The drum part has got a nice grace note on the snare, and it came together really quickly." "I don't know if anyone else will agree with me, but I think that this song would be great for a science fiction movie soundtrack..."
"This was really cool because all I played was a floor tom and snare. In true Ringo sryle I put T-shirts on the drums to get that dead, dry, dirty sound,"
"Norah Jones is our special guest on this song and I'm playing my best Brazilian jazz - which I'm awful at! It's a real pastiche, but was great fun to record." "I actually wrote this track, so I sing and Dave plays drums on it. I've had a rough sketch of the song for a long time and Dave has always liked it. It's got a real Southern Californian feel and it was fun producing Dave on drums. Most of the tambourines that you hear are on the record are actually Dave - I hate playing tambourine! - but on this song it's me."